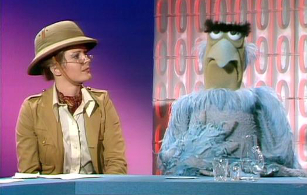 Candice Bergen debates travel with Sam the Eagle. With Candice Bergen, The Muppet Show had a perfect opportunity to concoct a classic episode. After all, it was rare for them to find a guest so comfortable with puppets. 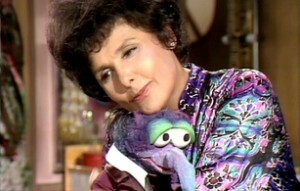 In fact, she had likely spent most of her younger years surrounded by them, given that her father was the great Edgar Bergen, one of America’s foremost puppeteers prior to Jim Henson (Edgar would later appear on The Muppet Show himself, making Candice and him the only father and daughter to ever both guest star on the show; he would later not only make a cameo in The Muppet Movie, but when he died shortly before its release, the film would be dedicated to him.). Sandy Duncan sits on a park bench with a friend. After at least a handful of uneven episodes–sometimes due to not utilizing a great guest star to their best advantage and other times due to a middling performance by a guest star dragging the proceedings down a bit–The Muppet Show finally finds its footing again with the Sandy Duncan episode, which benefits from a delightful celebrity who enthusiastically embraces every moment she gets with the Muppets, along with an actually terrific story thread which might not yet be developed enough to qualify as a plot but is one of the first season’s best examples of a running gag that actually holds it all together well. Even better, that gag springs from character and allows Fozzie to continue his development from the previous episode. A bird hits on Bruce. 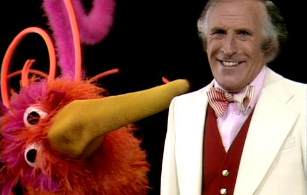 With the Bruce Forsyth episode, we have yet another mostly lackluster celebrity appearance. This isn’t helped by the fact that, despite Kermit extolling his virtues and calling him a “one-man variety show,” his singing, dancing, and comedic stylings fail to impress–or at least fail to impress a modern eye. I don’t know much of Forsyth outside of this appearance (other than that, in his later years, he was accused of being racist numerous times, but I’m sure British viewers could enlighten me further) but at least here he seems to be of the breed of male song-and-dance entertainers of the mid-20th-century who never seem more than adequately talented when viewed today. Peter Ustinov and Fozzie crack jokes. 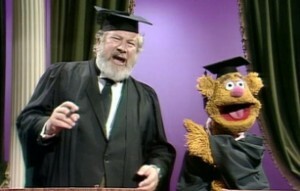 The Peter Ustinov episode of The Muppet Show is a perfect example of how, no matter how iconic and storied the guest star, whenever the Muppets failed to incorporate them into any musical numbers, the show usually suffered, particularly in the first season, when the writers made up for non-singing guests’ lack of singing by featuring them in additional comedy sketches, which, at this point, usually felt creaky and forced, since they were the epitome of the show trying to behave like any other variety show, which it was always so clearly begging not to be. Piggy succumbs to Charles’ charms. In previous posts, I spoke of how, in the first season, before The Muppet Show became a massive hit and celebrity guest stars were banging down the doors to appear, the show paid host to a number of lower-tier stars who were friends of the producers, doing them favors. 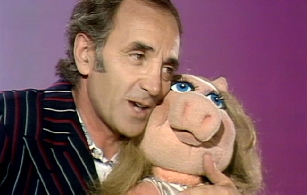 Well, given that the singer, Charles Aznavour, who Kermit calls an “international star,” seems to have only been truly famous in his home country, France, I’m going to assume that he was one of those people. He’s an adequate Muppet Show guest–nothing truly electrifying, even in his musical numbers, but he does a good-enough job of not drawing attention away from the real stars, The Muppets, and, more importantly, provides an excellent avenue for the show to truly begin to explore Piggy’s fascination with all things French. Paul Williams isn’t even the tallest person on The Muppet Show! 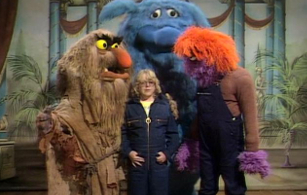 Remarkably, the Paul Williams episode of The Muppet Show received an Emmy nomination for Best Writing on a Variety Show. Unfortunately, the reason I find it remarkable is that it is easily the most poorly written episode up to this point with a higher-than-usual number of jokes that completely fail to land–for example, the Newsman sketch this week features an “important, breaking story” about a retired shoe salesman, played by Williams, whose telephone rang but, when he picked it up, discovered that the caller had hung up, likely an attempt to satirize the media’s propensity for overhyping minor stories, but that doesn’t make it actually, well, funny–hardly any narrative structure holding it together, and an obsession with the guest star’s diminuitive stature as the sole source of humor surrounding his appearance.